Gel manicures are all the rage these days. If your friend isn’t sporting some sort of bedazzled nail art involving intricate designs, she’s probably wearing a plain gel color that’s guaranteed not to chip for almost a month. I tried the latter once—and only once. It wasn’t that the color didn’t last—it was more durable than any polish I’ve ever tried—or that I objected to the price, which is around $60 for a three-week-long guarantee of tidy nails. It was because deep dipping my entire fingers into acetone to soften the shellac prior to removal ravaged my nail beds, leaving them dry as a bone for weeks afterwards, not to mention the harsh pulling and prodding of the manicurist as she used a specialized tool to pull apart the gel itself. I had virtually no color left on my nails, which normally have a healthy, pinkish hue. And this was long before the press release highlighting the increased skin cancer risks associated with UV drying landed in my inbox and scared me straight off the trend. “The use of various nail enhancements and gel manicures leave nails in desperate need of care,” says Katie Jane Hughes, butter London’s Global Colour Ambassador in the press release for the company’s Patent-Gel Top & Tails Set ($40). “In some cases, the removal of enhancements can also damage nails.” The gel-like duo is formulated with horsetail extracts, wheat, keratin proteins, and calcium minerals, all of which are proven to strengthen and repair brittle nails. In just a few short days, my unvarnished nails seemed to have a new life after just using the basecoat, which seals nail edges so that they’re less susceptible to splitting. When used together, the nails regained their inner firmness and refused to bend or peel. 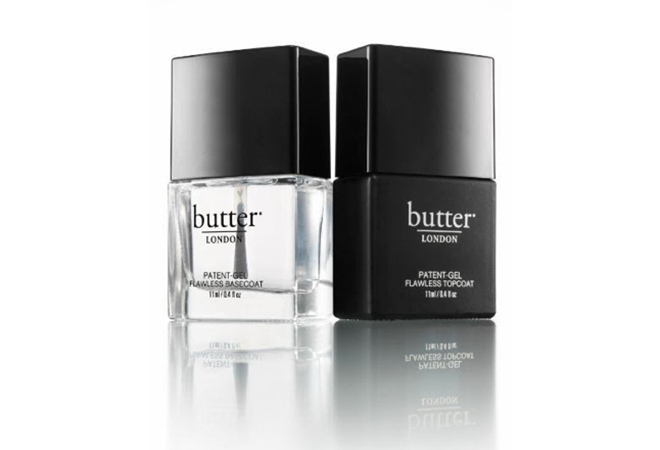 To use: Apply one coat of your desired color and two coats of the butter London basecoat. Then apply the final coat of polish, followed by butter London’s topcoat. The result was smoother, better-looking nails that didn’t chip or flake as easily, and work fine with standard polish remover. Will I go back to gels? Never. I’ll stick to my old-fashioned way : painting my nails with my signature vamp lacquer and touch them up with an office Sharpie as necessary.